Alrighty then! Here are my remarks on each entry. Yes, you will notice a lot of discussion about theming (how the name matches the mechanics, or vice versa) because I'm a sucker for good theming. This game, whenever you would trash a Copper or Silver card, eat it instead*. If you did, you become protected from the starve to death rule. Okay, yes, it’s a joke card-shaped object, but it gave me a laugh. You get a silver star for that, hhelibebcnofnena. Discard the top card of your deck. If it's a Silver, put it in your hand. I like that it interacts with other cards that interact with Silver. Whether it’s as good as Fishing Village or not remains to be seen, but I like that you went in a different direction, NoMoreFun. As a theme nerd, I’m not sure if a Sterling Village is actually a thing outside of naming a retirement home. Very strong Big Money card, as it basically turns Silvers into Counterfeits (minus the blocking). Okay enough with the right engine that still allows Silvers, but I think it might be far too strong for Big Money, silvern. Also, I’m not a fan of naming a card after a real person. Gain a Silver to your hand. You may put it onto your Iwami Mat. Worth 1vp per 2 Silvers you have on your Iwami Mat (rounded down). Again, majiponi, naming something after a real, unique place is not my favorite in terms of theming. I do like that you got me to learn about Iwami-ginzan, though. The wording is a bit clunky, but the idea is different. I would be interested to see how viable this is as an alt-VP strategy. Apart from a few cases (getting just enough to nab a crucial Province, for example), I don’t see keeping the Silver as viable as just building your Iwami score, especially considering that you need a good engine to play the Iwami Mines and get enough to make the whole process worth it. When you gain this, gain a Silver. If it is not your first turn, set it aside. If you did, add it to your hand at the start of your next turn. Thanks for attempting my discarded challenge idea as well, King Leon. You get a silver star! And honestly, I like cards that result in endgame shenanigans. It gives the game a special, evil flavor. Mwahahaha! 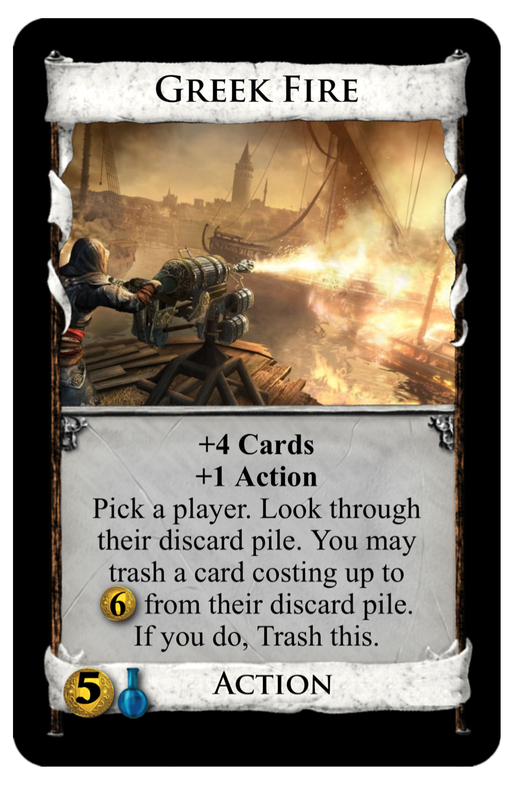 It works as a $1 card, in my opinion, as it is basically just a Ruined Market with a Merchant-Ship-esque on-gain effect. I’m okay with the first-turn clause just out of principle. Theme-wise, you get the Silver Gift when you get it, but then you’re left with a mostly useless box. Unless you have a cat. If it’s your Night phase, you may trash a Silver in play. If you did, then each other player reveals their hand. If they have any Night cards in hand, they gain a Curse. If they don’t, they discard down to 4 cards in hand. Otherwise, gain 2 Silvers, putting one into your hand. I do really like the theme, especially if Werewolf is in play. Shoot the bullet, or get two more? Gotta admit, I’m a sucker for effects that really fit the name. The wording, though? Clunky, clunky, clunky. I get that you can play it as an Action to get the two Silvers with one in hand or play it at Night without trashing a Silver to effectively just gain two Silvers. Would be interesting in a Feodum/Gardens game, but it also makes itself susceptible to Cursing. Good attempt, ClouduHieh; just a little too situational overall. Show up to 4 silvers from your hand. +1 card per Silver shown. A nice simple card from lompeluiten. Editing nitpick: it should be “Reveal up to 4 Silvers…” rather than “Show.” It is similar to Shepherd, but you don’t discard the Silvers. It has potential. I do not like the name, though, as it evokes Bank and thus explains the effect confusion from earlier. You may exchange a Silver in play for a Trade Agreement. If you didn’t, exchange this for a Copper. Ooooh! I like this, faust. Super-powered when compared to Silver, but without Silver, it becomes a worthless Copper. I can see it as a good card for the early game, assuming there are good expensive cards or a good array of cheap cards that you want early. Then, you just need to get rid of the Copper this will inevitably become. In all honestly, though, I see it being used more often as a one-shot Super Gold, so I’m not sure how often the Silver effect will be used or even necessary. But yeah, the theme is perfect. At the start of your turn, gain a Silver to your hand and discard a Card. Reveal the top 3 cards of your deck. If one is a Silver, put them all into your hand. Otherwise, put one into your hand and put the rest back in any order. When you play a Silver, +1 Buy. And Gubump delivers a simple yet solid project that rivals Fair. 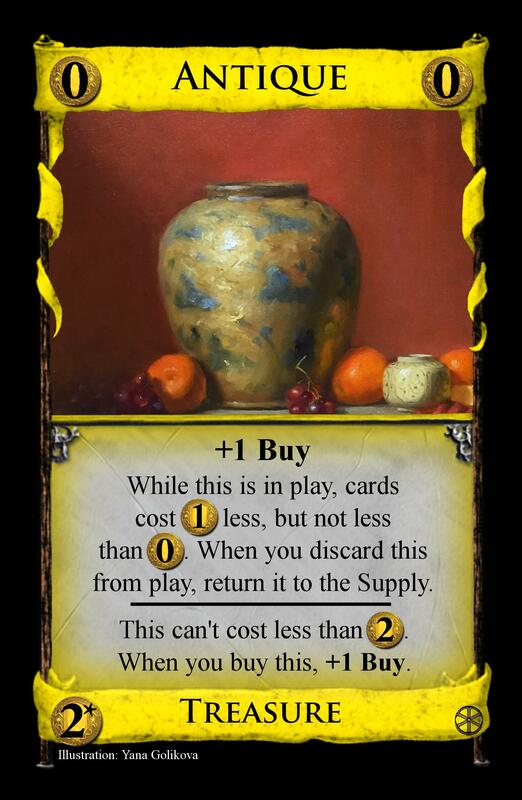 While the latter gives you an extra Buy every turn, Marketplace can deliver more Buys with the presence of Silvers. Whether a lot of Silvers and thus Buys are necessary can be very board-dependent. I just don’t know if it’s distinct enough from Fair to justify a victory in this challenge, to be honest. Choose one: trash a Silver from your hand for +4 Cards; or gain a Silver from the trash to your hand for +$2. 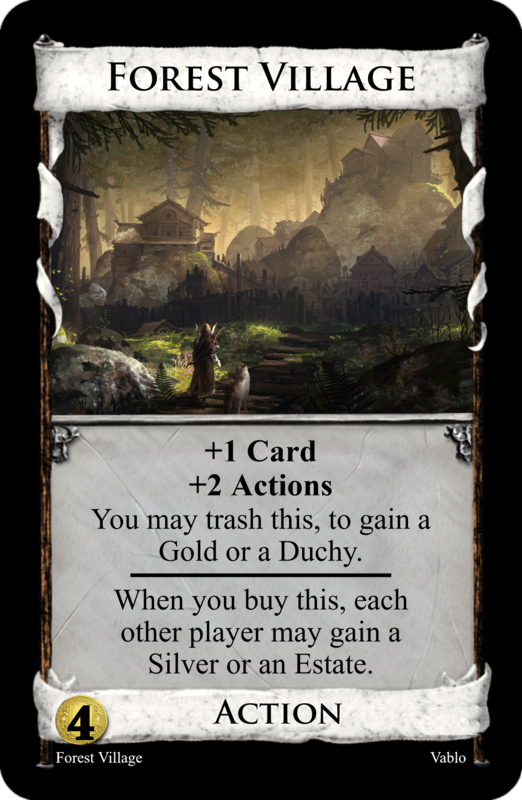 With some villages in play, and assuming there are Silvers in hand/trash to make it work, I could see this as a fun card. I’m with Gubump that a Silver in the Trash per player would be a good addition. Trading Quarter isn’t the worst name, but I like Harbor, too. Either way, Aquila, good work. You may trash a card from your hand. Otherwise, trash this and gain a Silver. While certainly not as powerful as Chapel, a non-terminal trasher that can trash itself for a Silver is not bad at all. Certainly better as a $2 than a $1, Shard of Honor. Not sure about the theming, in all honestly, but it’s not terrible. Choose one: You may discard a Copper from your hand for +3 Cards; or a Silver for +4 Cards; or a Gold for +5 Cards. Put your golden hay into the Barn and get a workhorse out. Okay enough. It’s not lame at all, Gazbag. It’s honestly a decent Smithy variant that works best with Silver, if you ask me. A good BM card for sure, but may not be optimal for all engines. You may trash a Silver from your hand for +2VP. 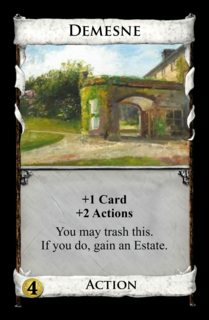 A different take on the vanilla effects from Sterling Village, stechafle instead has you trade a Silver for some points. Honestly, though, this effect won’t be all that great until the endgame when points are more important than Silvers. Until then, it’s a non-Duration Fishing Village. The name works overall, anyway. Reveal your hand. Discard a card per Silver revealed this way. When you gain this, each other play gains a Silver onto their deck. The gimped Smithy effect is decent enough, Chappy7. However, the on-gain effect seems very interesting, indeed. It can help sometimes, but for mirror Silver Workers and tight engines, it can often be a decent attack. The effects are nicely cohesive. I just think the name does not fit. Why would a Silver Worker be hurt by their own Silver? Too bad Werewolf is already taken; Wererat, maybe? You may discard a Silver. If you do, +3 Cards, +2 Actions, +1 Buy and put a card from your hand onto your deck. If you don’t, gain a Silver. “If you don’t” should just be “otherwise.” The effect is okay, if a little overwrought. Surprised it took this long for someone to claim the name “Silversmith,” segura. It works with the mechanics, I think. You may trash a card from your hand costing at least $2. If you do, +2 Cards. Otherwise, gain a Silver. A good way to get rid of those Estates early on, or it can at least give you fuel for later uses. Mad Scientist is such a perfect name, too, as it relates to Laboratory but the madness can force you to trash or gain Silver. I like it, LibraryAdventurer. Discard two cards. You may trash two Coppers in your discard pile. If you did, gain a Silver to your hand. A specialized Trading Post variant like this could have some early game use, especially with the discard effect. However, once your Coppers are gone, this is a pretty poor card. Smelter may have more uses later in the game, at least. Both themes are good, though. As for shrinking, when you put in the image code, add “width=200” or some similar number after the “img” in the first set of brackets (no quotes, of course, and make sure there’s a space between “img” and “width”). You don’t need to do anything to the /img tag. Does that make sense? Anyway, welcome to the contest, wittyhowlard! A Smithy you can pay extra to effectively make it non-terminal. I like the choice aspect, and whether it favors BM too much? I personally have to see it to believe it. The name is perhaps a little too neologistic, but overall, it’s a good card, Asper. When you play this, +$1 per Silver you have in play, and if it’s your Action phase, +1 Card, +1 Action, +$1. Nice work with the rewording, FlyerBeast. It’s a Peddler variant that could be really something with Storyteller, Villa, etc. With the right boards, it could be a rather powerful card. 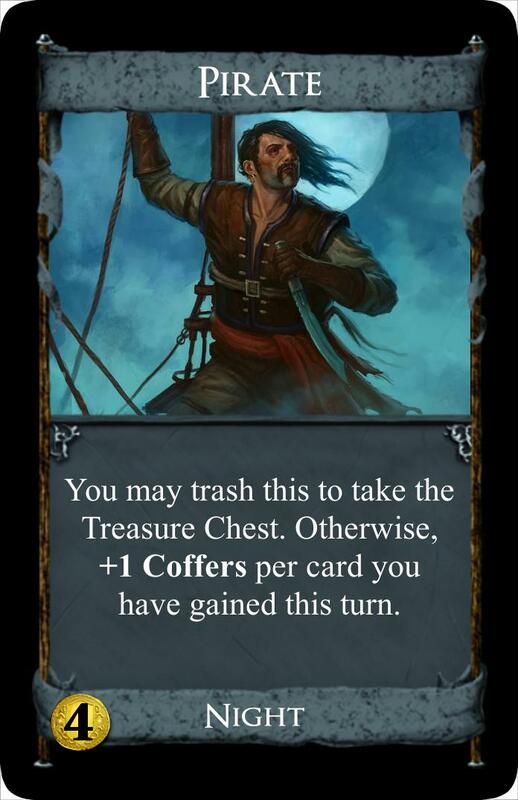 For most games, it’s just a Peddler that can be played as a Treasure with Silvers in play. Decent theming. Reveal the top card of your deck and put it into your hand. If it’s a Silver, +2 Cards. Otherwise, gain a Silver. A very fine entry to end the contest, crlundy. Either it’s a Menagerie or a Silver-gaining cantrip. The name works well enough with the mechanics, too, and I like your story for it. Not much else to say, really. This is a very difficult decision, but I’m basing it on all aspects of the entry: mechanics, wording, pricing, naming/theming, image use (when available), creativity, and how well it utilizes the challenge of involving Silvers. WINNER: Silver Worker by Chappy7! Theming issues aside, I like how all three major mechanics of the card work together, especially with the Silver challenge. RUNNER-UP: Trade Agreement by faust. I was so close to giving this the win, but my misgivings about the Silver-exchange kept it out of the win. If your card's name is bold, that means I really liked it overall, so consider yourself an honorable mention. Design a card, not a card shaped thing, that has a one-shot on-play ability. Examples include Mining Village, Embargo, and Feast (if it was still around). I would also count Spoils and Madman if they were supply piles. I wouldn't count Prince, Hireling, Inheritance, or Projects, since they have continuing effects. If it is something like Mining Village which has an optional one-shot, the one-shot ability needs to be tempting enough to make interesting decisions; or if it has a mandatory one-shot, like Embargo, Spoils, and Experiment, it needs to be worth buying in the first place. If I didn't explain very well, ask me questions and I'll get back to you ASAP. Ready go! The one-shot could be too weak / attritional and the normal ability could be too similar to Merchant Guild (but unlike Merchant Guild it does not provide you the ability to gain more than one card). 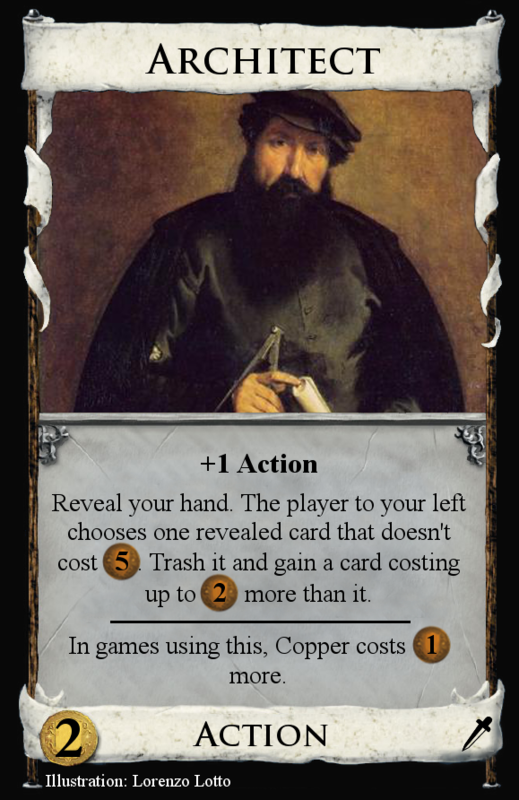 Gain a copy of a card you have in play. You may put this onto a Kingdom supply pile. While this is in the supply, it costs $1 less for every two cards in its pile, but not less than $0. 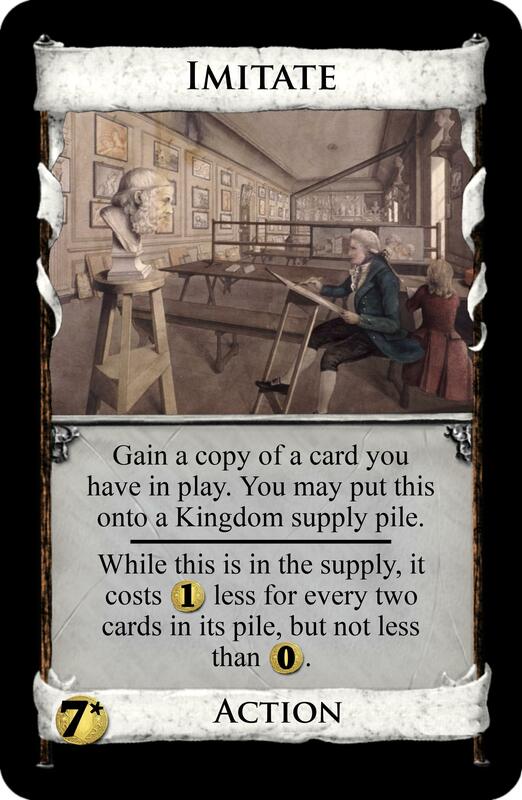 Clarification: When this is on a supply pile of another kingdom card, it acts the same as if it were the top card of a split pile. You can put this on empty piles, and they will no longer be considered empty. I tried to create a worthwhile feast replacement. this can gain you a 5$ card and trash an estate with it. our you can trash a copper to gain another upcycle or a silver. Even in the lategame you can trash your 5$ card or Gold into a Province. Just a question, would passing the card around satisfy the challenge conditions? If I have time to do an actual submission, and it is allowed, I'd probably look into this design space a bit more. Edit: This submission doesn't count, so I'll think of another. Thanks for the feedback! once for each $1 you overpaid. I'm stretching the brief a bit far, please let me know if it's too far. The effect of the card is a one-shot, but it does stick around doing almost nothing in your deck thereafter. I'm moving some word complexity to the rule book with the parenthetical. I hope it's clear, for example, if you overpay by $5 you put 5 coin tokens on it so that next turn you remember how much you paid. The one-shot does not need to trash itself, right? Right. It could return to the supply, it could get set aside for the rest of the game, or whatever else people come up with. Hmmm. Interesting. I think this does count! What I had in mind wasn't exactly an on-buy effect, more of an on-play sort of thing. I didn't think to specify that though, so that 's my bad. I'll edit my original post. Although I think this is really clever, I think it doesn't quite fit the spirit of the challenge. FWIW I like the card a lot. Graduate - Action, $4 cost. The next time you gain a non-Victory card this turn, trash this to gain a copy of it. 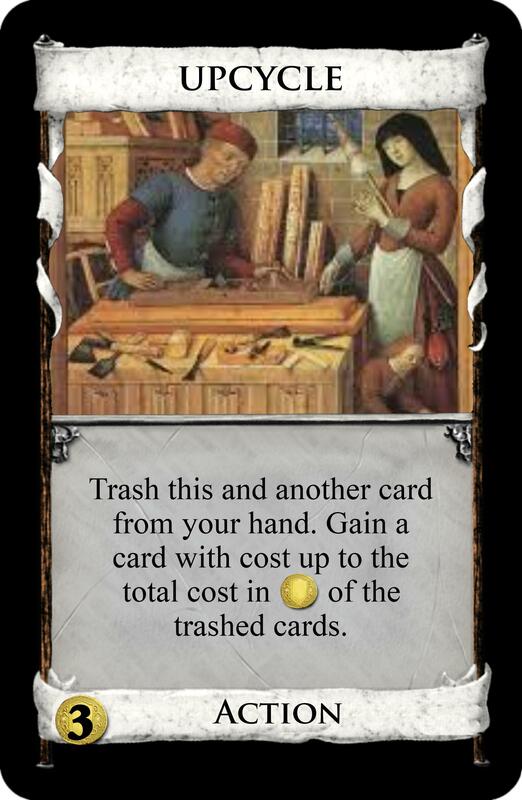 At Clean-up, if you didn't gain such a card during the turn, +1 Coffers. This is my former submission. The more you collect of these before playing them, the better payout. I worry that it creates too much pressure on games, and players are forced to keep hold of some to prevent somebody getting too many at once. Possibly I'll make it so there's only 8 in the pile to help. I thought it was too strong for $4 but too weak for $5, so I added the drawback to make it more balanced. Return this to the Supply. The kingdom card pile has the regular number of 10 copies. My idea is pretty similar to overpay for Coffers. However, this one has some twist. Like real Coffers you can save the Moneychanger for later, but it may not be always available. On the other hand, it is combinable with Throne Room variants or cards which interact with Actions. Starting with 2 Moneychangers and one Vassal is pretty good and regardless, whether you start with 5/2 or 4/3, you can always do this opening. There are also some tricks. If there is no +Buy in the kingdom, you can turn your workshop to a Ruined Market, which may be useful, if you have $10 or more in your hand. Moneychangers also help you to get to $10. So this synergy could see some usage. Fun fact: When I created this card, I was not aware of Experiment, which is similar, but more expensive, usually stronger and has a less flexible on-gain effect. have 5 cards in your hand. This is a new Chapel. It's more awkward at trashing but because you still get to have your turn it's more... explosive! Here's a card from my set Dominion: Greed that I hadn't gotten around to posting. $3. When you play this, either trash this or discard a Treasure, then each other player discards a card for each coin in its cost, and then draws until they have 3 cards in hand. In games using this, when you buy a card costing $5 or more, trash a card you have in play. *The number of cards that players discard are equal to the cost of the Treasure you discard or the War Flag if you trash it. Yes, that means that players discard 6 cards when you trash War Flag with no boundary (and then draw until they have 3 cards in hand). Discard a Silver to make it a Copper-Legionary. 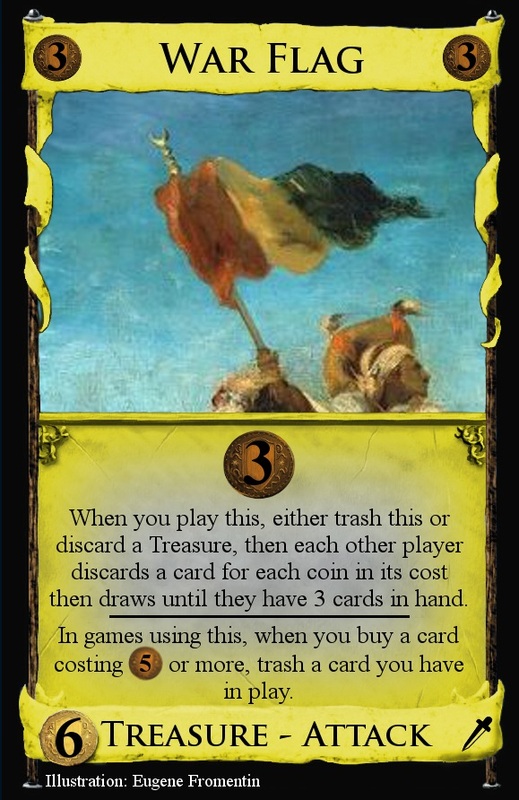 Discard a Gold or War Flag for an amazing Minion-style Attack, even though it effectively doesn't generate $. That milling Attack is stupidly powerful, which is why its In-Games-Using-This effect aids in improving your deck early (so early War Flags aren't as devastating), but the fact that the on-buy trashing is mandatory creates many interesting considerations as you proceed: Fast trashing will inevitably have you cannibalize yourself too fast, since you're losing a card for every $5+ buy; you still need to figure something to do about your Estates, so some tempo-trashers might be worth buying to rid yourself of that pesky starting green; the free tempo-trashing provided by every $5 card makes power situational cards better since it is so easy to justify throwing them out later; and greening breaks you down faster since you start throwing away your cheaper economy bits as you buy Provinces. EDIT: Attempt to clarify wording. I like it. Thematically it would be cooler if the effects were "when you trash" effects but that may cause problems. I like it, but maybe it could only trash one card, and have a cost in some other currency...? The "Return this to the Moneychanger pile." instead of "Return this to its pile." is intentional, in the case, this starts in the Black Market deck. It loses track, when there is no Moneychanger pile. A cheap $2 Peddler for you. An empty Moneychanger pile is in fact a Moneychanger pile with zero cards, however. This is unnecessary; see Encampment. I don't really think this needs to have 20 copies. It does return to the supply after all. It is very expensive but even at $5P a triple Lab is too good. I mean, DXV has tested a double Lab at Debt costs and it was too crazy so a triple Lab without any drawbacks probably always is. Just getting into Dominion in recent months and not necessarily familiar with all the cards in recent sets, but this thread looked fun. This may be considered a bit dull, but I do like Mining Village as a design of a card. Trashing this has the same value in that you can gain a card costing 2, but you don't need a +1 Buy and so lose any flexibility. I think that this will have an even narrower use than Mining Village. Like Mining Village you will only trash it when you (estimate that you) play it for the last time whereas Mining Village can also be used early on to spike.